With so many types of paint available, consumers can easily be overwhelmed by the decision whether to buy regular, low-VOC, no-VOC or more unusual paints. According to the US Environmental Protection Agency (EPA), volatile organic compounds (VOC) are toxic gases that are emitted from certain solids or liquids. Paints, solvents, varnishes, lacquers, paint strippers, cleaning products, pesticides, building materials, furnishings and many more items can emit VOCs. Because indoor concentrations of VOCs can be up to 10 times higher than outdoor concentrations, many consumers choose to eliminate one source of these gases by using environmentally friendly paints. 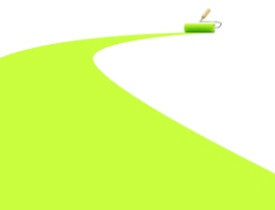 Eco-friendly paints not only reduce pollutants inside the home, but reduce the amount of toxins that would otherwise pollute the environment. Consider that washing paintbrushes in the sink releases VOCs into the water supply and careless disposal of excess paint likewise pollutes landfills or water supplies. Low-VOC does not mean non-toxic. This designation only means that fewer harmful ingredients are present in the product. These products can still contain ammonia, acetone, fungicides and biocides. For a nearly non-toxic paint, select no-VOC paint, but keep in mind that adding pigments to the paint can slightly raise the VOC levels. American Pride Paint claims its paints are low-odor, washable and durable. Its products have earned Green Wise certification. American Paint says that all of its products are Green Seal certified. Additionally, like other zero-VOC paints, the company's products do not contain lead, mercury, formaldehyde, formaldehyde precursors, crystalline silica or other toxic agents or suspected carcinogens. The Real Milk Paint Co. developed milk paint (also called casein paint) as an eco-friendly paint that is best used on antique furniture, decks, floors and walls. Mix pigment powders into the paint to create unique colors for your project. Bio Shield Healthy Living Paints sells eco-friendly paints, thinners, finishes and cleaning materials. Its products are no-VOC, low-odor and non-toxic. According to the company, "The BioShield collection of paints, stains, thinners and waxes is made primarily from naturally-derived raw materials including citrus peel extracts, essential oils, seed oils, tree resins, inert mineral fillers, tree and bee waxes, lead-free dryers and natural pigments." Mythic Paint sells products that are third-party certified. They are 100% non-toxic, "ultra low-odor" paints. Remember that low-VOC does not mean the paint is non-toxic and safe. Zero-VOC and natural paints are the ideal products for environmentally aware or chemically sensitive consumers, but make sure to carefully read the labels on any product marked "no-VOC," as many still contain biocides and fungicides. With so many home products off-gassing harmful components, do yourself, your family and the environment a favor and use products that are naturally derived and safe for all concerned.